Jared, Karen, & Daphne: BIG NEWS!!! We have successfully entered Week 13, leaving the first trimester behind! Our baby is due on February 2, 2011, and we are VERY excited! I have been fortunate in not being very sick, however I have spent the past 3 months sleeping about 12 hours per day! My sense of smell is impeccable! Most of all, I'm just ecstatic about having a baby and we are so excited about becoming parents! Quick story... During our last appointment, we were looking forward to hearing the baby's heartbeat; after the doctor tried to hear the heartbeat for 5 minutes with no result, he brought in an ultra-sound machine. I was in a bit of a panic, but the doctor soon calmed my fears and Jared and I were able to see the baby move! The doc said that everything looks great and the baby looks healthy, and we are so thankful to be expecting! 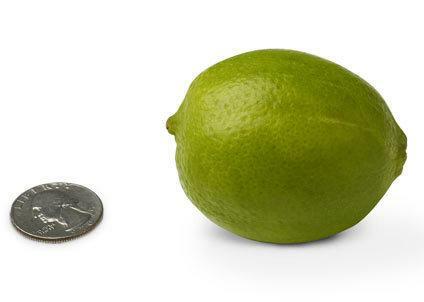 Currently, the baby is the size of a lime! How cute! the corndog/pickles thing makes me laugh...and the clean laundry makes me sad. the washing machines are sad. Congratulations! That is so awesome :) I am really excited for you two! You will be a great mom Karen! Super exciting!!! Good luck with everything!!! Congrats! You will love being a mom it is the best thing ever! Jared watch out! I think the dislike for "clean laundry" is just a ploy to get you to do the laundry. :) "Let's see....what don't I like to do...."
I'm super thrilled about the little baby (not baby daddy) that is growing in you Karen! We're just loving that little lime-sized baby already! !